We've created this in-depth weight plates buying guide to provide an overview of the different weight plate products that are currently available on the market. Depending on the type of weight lifting you are intending on doing, this guide will help you buy the most suitable weight plate products for your home or commercial facility. 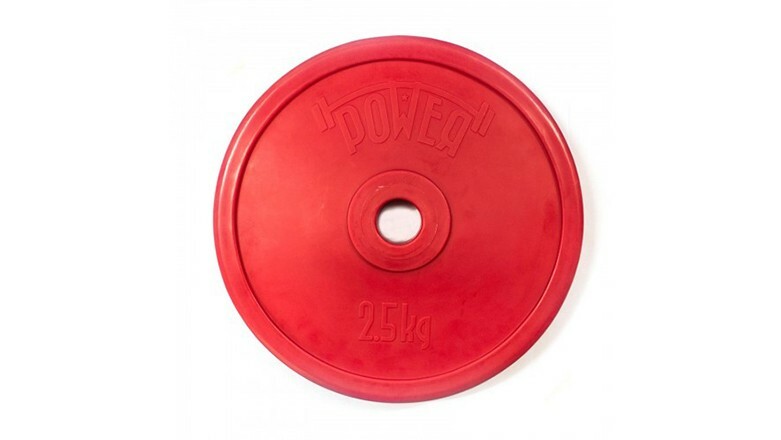 If you are considering purchasing weight plates, for either home or commercial use, it’s incredibly important to understand the different discs that are available. 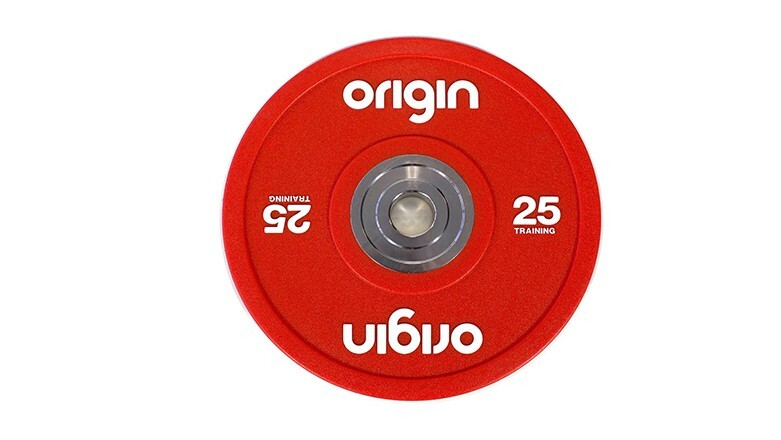 Olympic Discs a standard size across the fitness industry, are known as Olympic because of the 2" diameter centre hole. They fit all commercial bars and most plate loaded gym equipment ranges such as our Sterling range. Standard Discs generally considered for most home gyms, only have a 1" diameter hole. Standard weight plates will not fit on an Olympic bar. Studio Discs are specific to group exercise, universal to classes like Les Mills' body pump, during which participants typically won’t be working with very heavy loads. These plates tend to be rubber coated, small in size, normally with handles and brightly coloured. They are easy to identify, are easy to store in the corner of your studio and can be quickly added and removed from specialised studio weight bars. The also have a small 30mm centre hole. Olympic weight plates are much more stable on the weight lifting bar. They are much more versatile - The number of exercises you can do with Olympic weight plates far outweighs standard weight plates. Olympic weight lifting bars are built to hold a greater total weight and some power racks and weight benches are made to fit the 7ft Olympic bars, as opposed to a 5ft or 6ft standard bar. 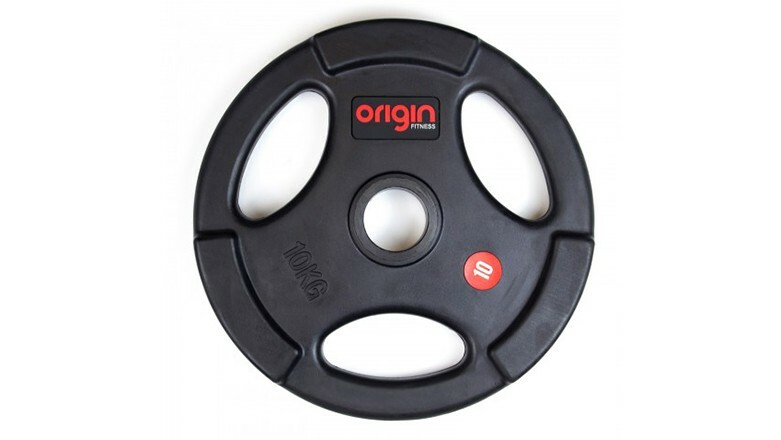 To summarise all the different kinds of weight plates you will find available to buy on the market we have provided an overview of each type: rubber coated, technique, bumper, competition weight plates, fractional plates and cast iron. Rubber weight plates are exactly the same as cast iron weight plates, but with an extra layer of rubber coating for safety, protection and longevity. The rubber coating helps both the weight plate and the floor to a certain degree, and will ensure that the plates are longer lasting and harder wearing. One step up within this section is urethane coated plates. These are generally the same dimensions and shape as rubber plates, but are much more durable and less susceptible to markings and cosmetic damage. As well as marking less easily, these plates will not mark your floor, walls and other equipment like rubber plates will. They also have the benefit of not offgassing, which some rubber products do in gym environments creating an often unpleasant smell. 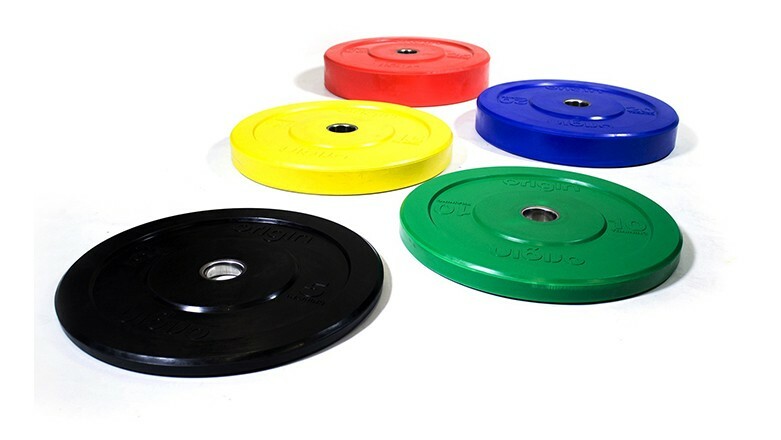 With rubber coated weight plates, it is quite common to see terms like “non-standard Olympic plates”. 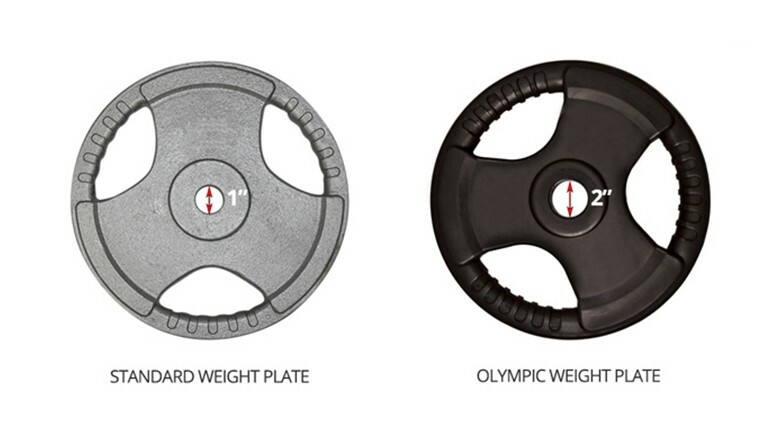 Non-standard Olympic plates are plates which are made to fit Olympic sized bars but have a reduced circumference when compared with a traditional Olympic weight plate. The main thing which makes a plate non-standard is the presence of grips, which are cut into the plate making them easier to lift off the ground, perform exercises without a bar and to place back in the weight rack. Demand for bumper plates has been increasing over recent years due to growing popularity of Olympic lifting, some of which can be attributed to a rise in the number of people participating in CrossFit training. 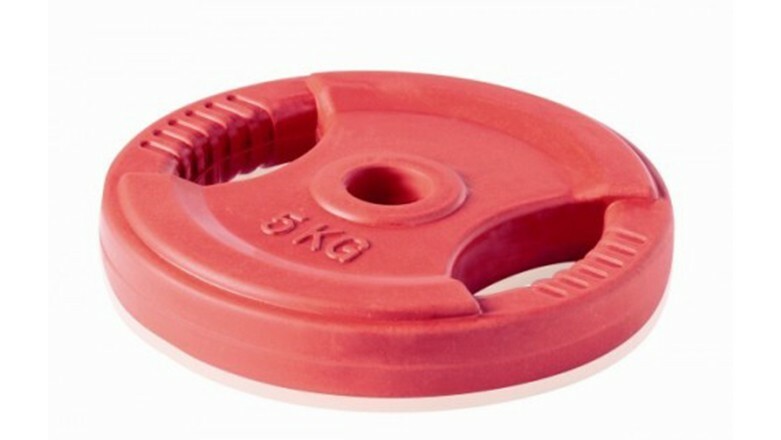 A bumper plate is a solid rubber weight disc which can be safely used for performing Olympic lifts and can be dropped from a height during exercises like snatches and presses. The purpose of bumpers is to create a safe environment and allow certain exercises to be performed without the risk of damages to the floor, equipment or athlete. Strength and conditioning coaches and gyms have long been using Olympic lifts in training, and weightlifting as a sport relies upon this core set of movements that require the use of bumper plates. The first kind of bumper plate available is a technique plate. These are very basic and made from a simple single piece of rubber, without a metal ring around the hole. These only come in light weights and are perfect for introducing beginners to Olympic lifts and helping athletes improve their technique. 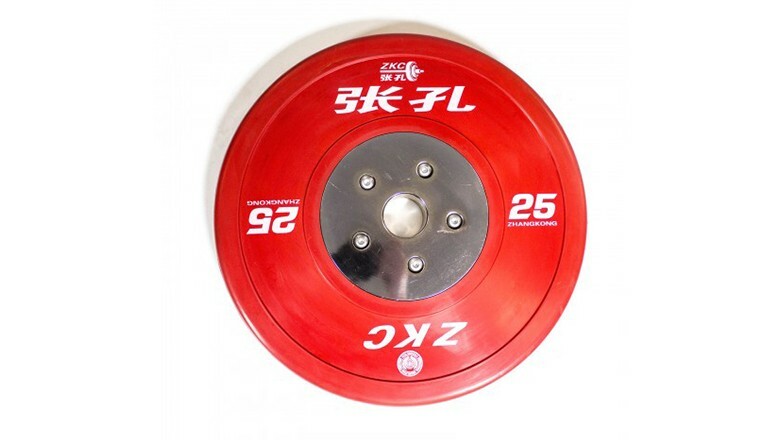 Facilities tend only to have a small set of technique plates and they are normally only produced in 2.5kg and 5kg weights, otherwise training or competition plates would be used. Training bumper plates can vary slightly in depth but will all, for the most part, be a similar diameter. 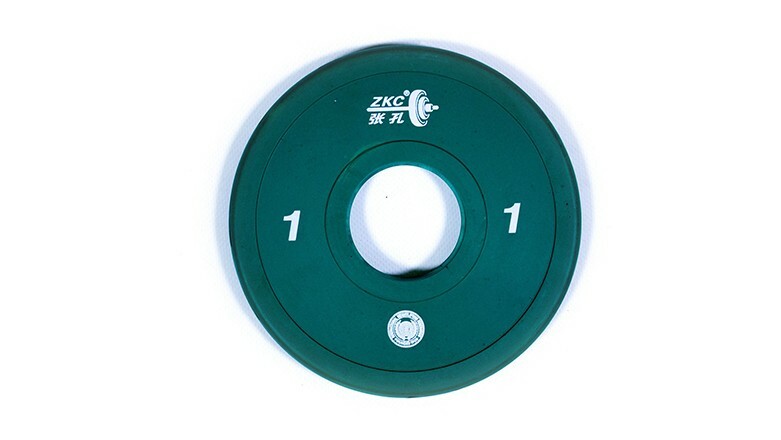 Top manufacturers like Eleiko and Zhangkong produce training plates which are the exact dimensions of competition weightlifting plates. More affordable training bumper plates may not be the exact depth of IWF competition plates, however they will, for the most part, stand up the Olympic lifting requirements of a specialist facility, commercial gym or CrossFit box. Training plates usually come in black or are colour coded by weight. The factor which separates Olympic competition plates from training plates and all other kinds of free weights is the calibration. Official IWF Competition rules mean that plates need to be accurate to +0.1% and -0.05%. This means that production of a 25kg plate only has a 25 gram margin for error. The result is that Competition bumper plates are incredibly accurate and consistent, so the weight you are lifting is absolutely what you think it is. Origin Fitness is a proud distributor of Zhangkong Olympic weightlifting equipment which is IWF approved and has been selected to be used at the 2016 Rio Olympic games. Within our Zhangkong range we also have fractional (or incremental) plates. These include 0.5kg. 1kg, 1.5kg. 2kg, 2.5kg, and 5kg discs. The 0.5-1.5kg also have no metal insert within the centre circle. This is ideal when in competition, it means you can add these on the end without removing the cuff. The grip in the inner circle sticks to the bar and does not move, keeping the other plates in place. These plates generally come in cast iron, steel or a chromed metal. They are thinner than the plates listed above as they allow for more weight to be added to the bar, specifically in the sport of powerlifting. This is important to elite lifters and more advanced training centres as it keeps the discs closer to your centre of gravity eliminating any whip on the squat. The most important thing to do before purchasing your weight lifting kit is to figure out your target audience. This will allow you to figure out which kit and weight plates suit you and your facility to reach its full potential. Have a look at our barbell buying guide for further help in completing your kit selection. This entry was posted in Buying Guides, Knowledge & Advice on 6th June, 2014 by Colin Evans.